Think famous fictional cyborgs, Darth Vader of the Star Wars episodes, or recently, Tony Stark of Iron Man. But have you ever heard of Kevin Warwick? A real-life professor at the Reading University, who became the world's first cyborg by implanting a radio tag in his arms, while transforming his wife too. Being cybernetic, they communicate, take control of each other’s bodies via brain waves, and so on. Talk about connecting on a deeper level! Researchers at NTNU (Norwegian University of Science and Technology) in Norway, are developing a social bot that will possess the capacity to connect with a ‘brain’, by enabling interactions between nerve tissues and computers. As Stefano Nichele of the Department of Computer Science said: “We start with the machine, and then we ‘bring it to life’ by adding biological neurons. Then we have to keep them alive and get them to communicate with a computer.” With the help of this neurotechnique, the team is hoping to create a platform to better understand and study robotics, hybrid machines and neural signaling. The nine departments at NTNU working on this project predict that someday the cyborg will talk and liaise with students on campus. Lead researchers Dr. Ioanna Sanvig (INB), Dr. Axel Sandvig (INB) and Prof. Øyvind Halaas (IKM) along with their PhD students, cultured stem cells in vitro and thereby developed the biological neural networks. Micro-Electrode Arrays (MEAs) were used to help grow the neurons so that it can be appropriately installed into the robot by electrical stimulation. How? It is a known fact that, during development, neurons communicate with each other through signaling, as it does in the human nervous system. Now, the MEA records these signals and creates an interface between the living network and the robot. As part of their study, a closed-loop system was constructed so that the ‘brain’ will adjust and adapt to its new environment. 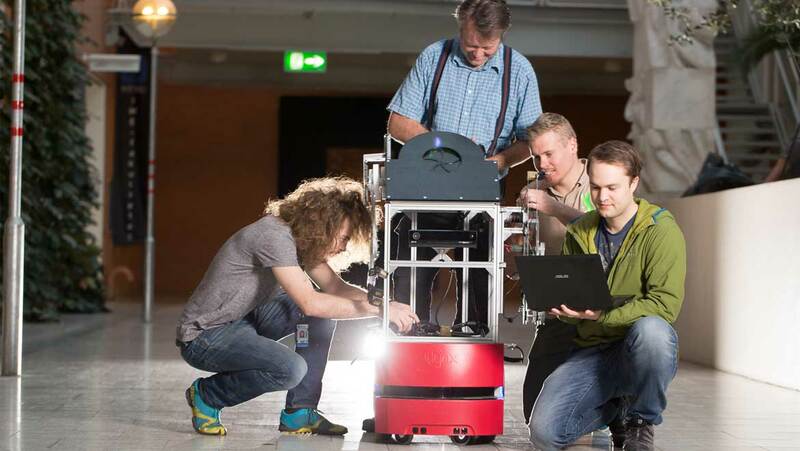 Under the supervision of Prof. Øyvind Stavdahl (ITK), the cyborg’s body is to be a freely moving autonomous robot. The Pioneer LX model can be equipped with sensors and maps for navigation without bumping into obstacles. For live streaming and providing visualization of the biological activity, an LED box will be installed by the creators. With the click of a button, stimulation will also be visible, and all these recordings stored on a database. Bio-robotic machines, as this cyborg, has the potential to bring together multiple interdisciplinary areas such as robotics, mechatronics, artificial intelligence and neuroscience, such that it will transform the face of research and development while creating a new platform for communications between man and the machine.